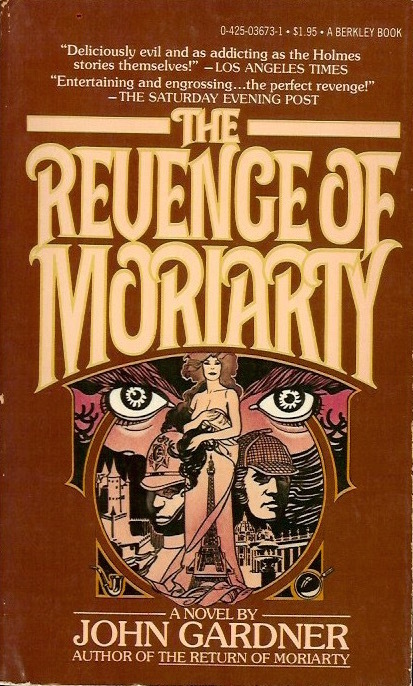 Long before the Anthony Horowitz bestseller, Moriarty, author John Gardner penned two novels about Sherlock Holmes' arch nemesis: The Return of Moriarty and The Revenge of Moriarty. The long delayed third book, originally to be called The Redemption of Moriarty, was published posthumously in 2008 as just Moriarty. This Berkley paperback edition of Gardner's second book was the first U.S. edition. THE NAPOLEON OF CRIME IS BACK! San Francisco, 1896. The foggy mists are lifting, and who should emerge from the sinister back alleys to reclaim his title as the most dangerous scientific criminal of his time but the nefarious Professor James Moriarty! Rising like a wicked phoenix from the ashes of his own destruction, Moriarty vows to launch a vendetta against the European underworld leaders who turned on him and left him in the clutches of Sherlock Holmes. Back in London to take revenge! Baiting them with their favorite vices––spectacular German jewels, a delectable Italian beauty, the prized Mona Lisa, a very accommodating servant girl––Moriarty plays on their sinful weaknesses, and one by one ropes them in as only he can. Then, daring to commit his most horrible scheme, the professor masterminds a plot to destroy the legendary Holmes by cutting off his cocaine supply and bringing him to public disgrace. Is there no stopping this dastardly genius? Does this really mean the end of the Baker Street Sleuth––and a gruesome triumph of Professor Moriarty? ?